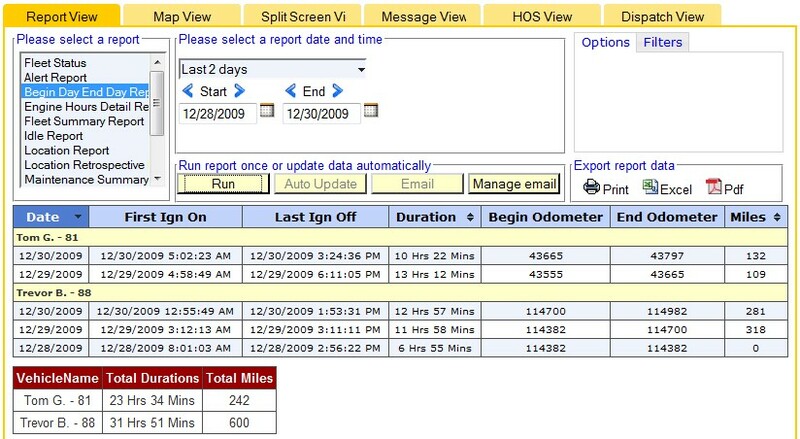 the day so you’ll know exactly when your drivers begin and end their daily vehicle activity. you will know the amount of time spent at sanctioned and non-sanctioned stops. may also detail break and lunch activity in between. 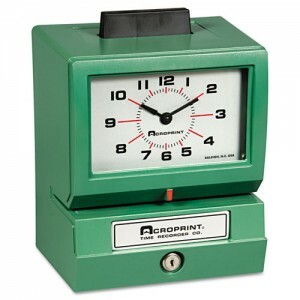 All entries are time and location stamped for consolidation with your payroll records. 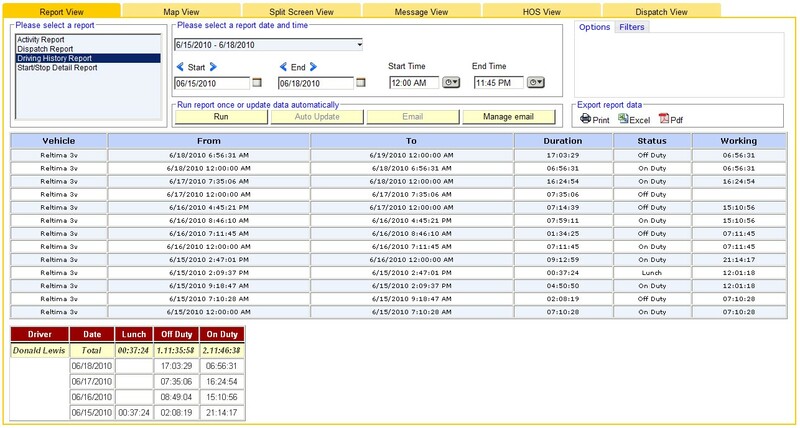 Using our Start/Stop Detail Report will give you the ability to review historical visits to customer sites and will allow you to change routes or orders of stops to improve their efficiency. 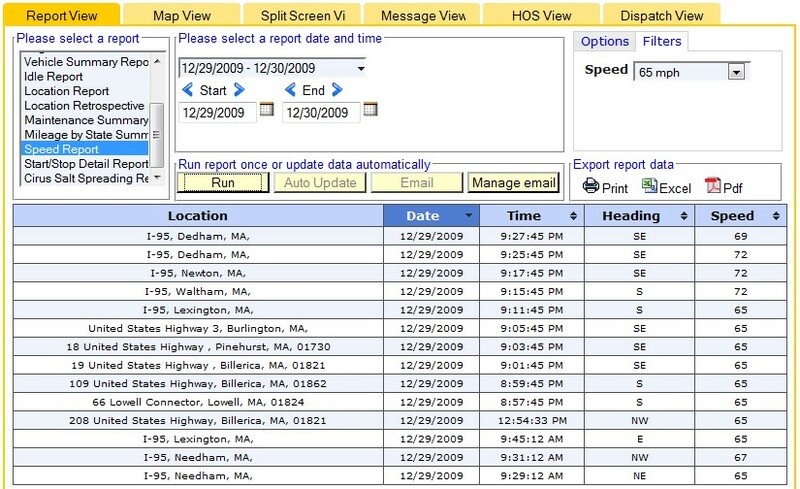 Our dispatch Report will give you historical data about route compliance that will help you make cogent decisions about which drivers are productive and those who need improvement.Use our Driver/Dispatch system with a Garmin navigation device to send routes with turn-by-turn directions to your mobile workforce so they never get lost again. Effective use of the CountryWide GPS fleet management system can ensure that your vehicles run better and last longer. This saves you the expense of purchasing new vehicles too soon because of poor maintenance and oversight. 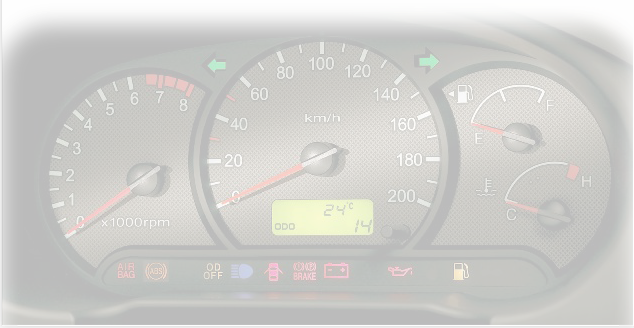 Using our Idle report to check and manage excessive idling will reduce degradation of oil viscosity due to high heat. This will enable your vehicle’s engines to run longer. Our Speed report will help you decrease engine wear & tear caused by high engine temperatures from excessive speeds. Reducing speeds will also decrease the likelihood of accidents which cuts your insurance costs. Our Maintenance Summary Report will ensure that you know exactly when your vehicles are in need of attention so you can make sure they are serviced on-time, all the time. 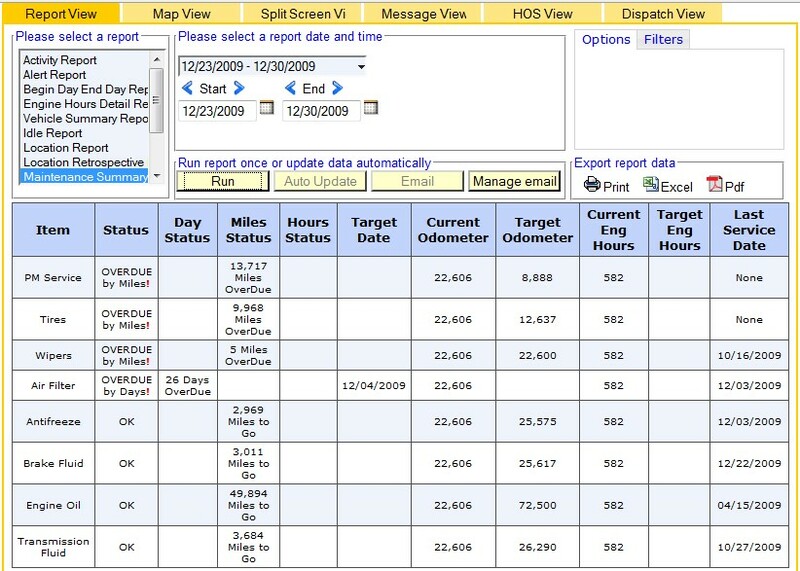 Lastly, our Fleet Summary report will give you totals and averages for metrics such as idle and stop time so you can build reward programs for reduced averages and accumulated savings from fleet to fleet. Our Speed Report will help you deal with chronic speeders on a consistent basis. You will have the evidence needed to take the steps necessary to modify this behavior before it results in a serious accident. Our Location Report will help notify you when vehicles are parked in non-work areas or other establishments (such as bars, casinos, shopping plazas or schools) so that you can reduce the likelihood of accidents or transportation of unauthorized passengers. Excessive idling and driving at high speeds increases fuel consumption and toxic emissions which are both responsible for increasing your carbon footprint. 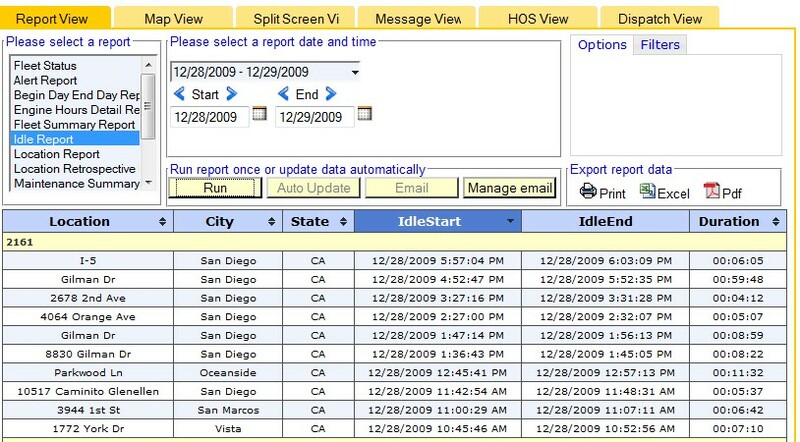 Introspective review of our Idle and Speed reports will give you the data you need to manage these problems swiftly and effectively. 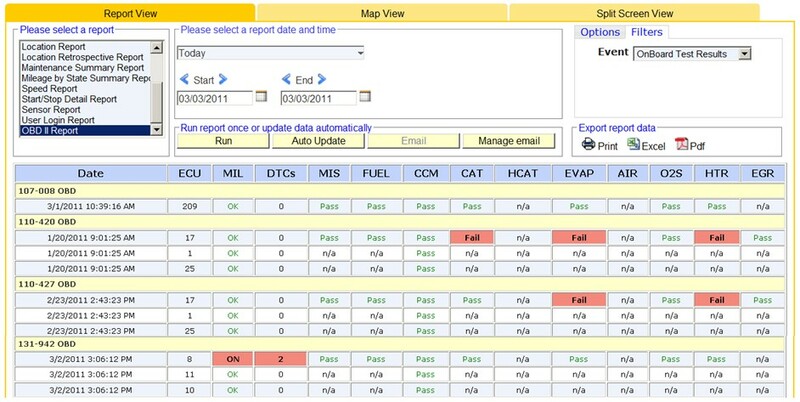 Also, use our FleetMD engine diagnostic system to discover emissions problems early. 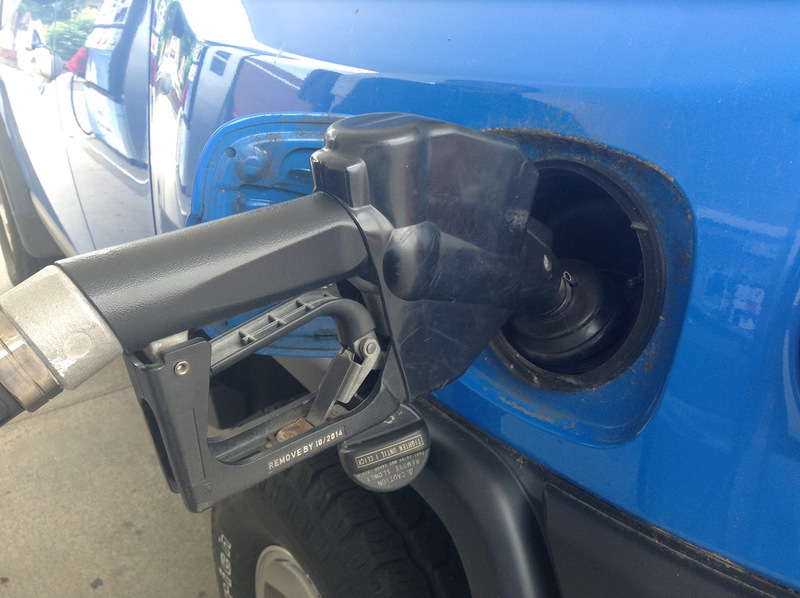 Dealing with these issues on a more timely basis can decrease your carbon footprint and reduce your vehicle’s impact on the environment. Use our Begin/End Day Report to check actual time card entries for compliance. any day up to 6 months in the past. 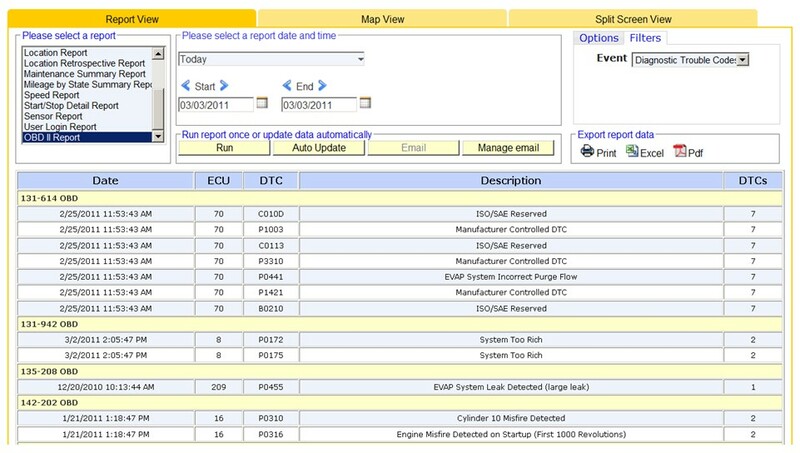 FleetMD gives you the ability to connect to your engine’s On-Board Data computer to review important powertrain metrics related to vehicle inspection compliance and diagnostic fault codes. This application will give you the tools you need to receive early warnings about potential problems with regard to engine functionality and performance. You may now service your fleet vehicles armed with the knowledge of existing or pending problems that need immediate attention. FleetMD can also help diagnose vehicle emissions and other issues that can result in failure of an inspection or can increase the size of your company’s carbon footprint. 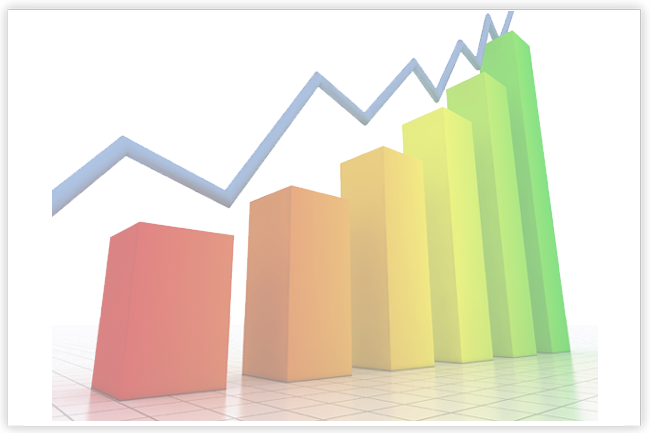 Statistics Validate the need for CountryWide . . .
fuel consumption increases almost 2% for each mile per hour above 50.
running a vehicle at idle speed dramatically reduces engine life. One hour of idle time is equal to using one gallon of gas. Excessive idling can waste up to 800 gallons of fuel annually for the average truck. 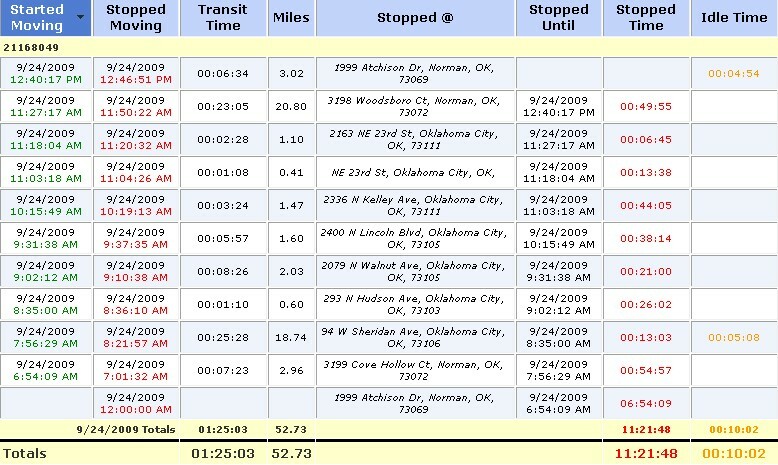 Inefficient routes, unscheduled stops and unauthorized trips can lead to serious overtime costs. day and excessive overtime costs. Gears, bearings, clutches, suspension, and drive trains all wear much faster at higher speeds. Increasing speed from 50 MPH to 60 MPH increases maintenance cost by 38%. Increasing the speed to 70 MPH increases the cost by 80%. Heat is the number one enemy of tires. wear properties to deteriorate rapidly. Tire wear will almost double at road speeds of 70 MPH or greater. your fleet more effectively – while improving the bottom line and increasing profitability.